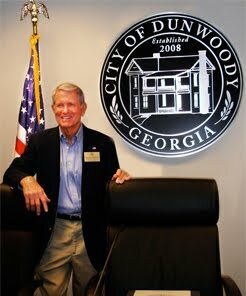 As most of you know I have announced that I am running for re-election to the Dunwoody City Council, District One, Post-1. 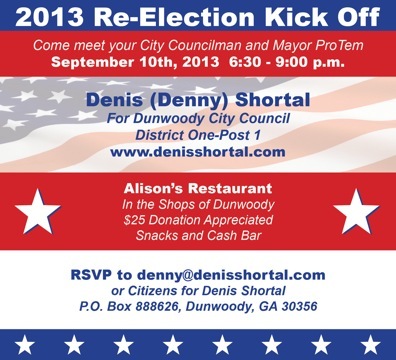 To start my campaign I am having a "Re-Election Campaign Kick-Off" event at Alison's Restaurant in The Shoppes of Dunwoody on Tuesday, September 10 from 6:30 - 9 PM (see the invitation below). It will be a relaxing and enjoyable night for me to get around and personally greet each of you and listen to your input about our City. I will take a few minutes to outline my accomplishments as well as my goals for the coming years to keep Dunwoody a place of pride for each us and the city of choice for those moving into the Atlanta area. I thank you for your strong encouragement and support over the past five years and I will continue to work to justify that encouragement and support. I look forward to seeing you on Tuesday, September 10 at Alison's Restaurant. 1. Alarm Registration ... If you have a monitored home or business alarm your alarm needs to be registered by 1 OCT 2013. Unmonitored alarms do not have to be registered. Registration is free for residential alarms and $25 for business alarms. You can register on-line at ... www.crywolf.us/oss/dunwoodyga. If you don't have access to the internet or have problems or questions call the toll free number 866-899-2365 or email dunwoodyga@publicsafetycorp.com. Yes, there is a fine for not registering your alarm and/or having two or more false alarms. The whole reason for the ordinance is to cut down on the massive number of false alarms that occur. The estimates I have seen is that answering false alarms utilizes the time of 1.5 to 2 police officers. This is time that can be better utilized patrolling our streets and protecting our citizens. 2. Our Police Department ... Our police have done some outstanding work spending many long quality hours on some high profile cases. The arrest and conviction of Hemy Neuman and Andrea Sneiderman on various charges in the murder death of Rusty Sneiderman. Neuman received a life sentence and Andrea Sneiderman was sentenced to five years in prison. The four individuals that were involved in the bank robbery in 2012 at the PNC Bank on Mt Vernon Rd have been convicted and three have been sentenced to prison terms of 7 to 27 years. The fourth individual will be sentenced this week. Lastly, our police have arrested several individuals in the shooting that took place last Sunday in the Terraces Apartments. A job well done to all of our Officers that keep us safe. 3. DeKalb County (DC) Interim CEO Public Meeting. The Interim DC CEO, Lee May will have a public meeting in Dunwoody on 5 SEP 2013 at the Dunwoody United Methodist Church from 7 - 8:30 PM. I urge all of you that can make the meeting to do so. I have been in a couple of meetings with Lee and my initial impression is that he is very open and straight forward in his comments. His initiative to eliminate the DC CEO position that he now holds should be very refreshing and encouraging to all the citizens of DC. There is a long way to go on that issue. 4. Dunwoody Public Open House Meeting .... This meeting is to discuss the proposed sidewalk projects on Peachford Rd, Hensley Dr and Mt Vernon Way. The meeting is at our city hall on 12 SEP from 6 PM - 9 PM. I urge all of you that live in these areas or have an interest in these projects to "get out ahead of the curve" by attending this meeting and voicing your opinion. It is best to voice your opinion at this meeting and not wait until after the project have been approved. 6. Zoning Rewrite ... The next special City Council meeting to continue to move towards approval of Chapters 16 and 27 of our "zoning" code of ordinance is scheduled for 6 PM at the City Hall on 17 SEP. The quickest way to review the rewrite is to go to the "home page" of the city website ... www.dunwoodyga.gov ... and on the far right side of the page you will see the word "Projects" and under that the first item Zoning Code Rewrite Project ... click on that ... this information needs to be updates and I will try to get that updated tomorrow. 6. 2013 Property Tax ... By now you all should have received your 2013 property tax statement. If you didn't receive your tax statement you can look it up on line at DC Tax Commissioners website .... http://web.co.dekalb.ga.us/TaxCommissioner/tc-home.html. Your first installment payment is due NLT 30 SEP and the second payment is due NLT 15 NOV. One issue this year is that some folks have been billed $400 vs the norm of $265 for sanitary fees. The explanation from DC is that the extra charge was levied on those citizens who have a home business. This item is still being worked by our DC BOC representatives. Stay tuned. 2. When making a turn you must stop until the pedestrian has finished crossing the side of the road onto which you are turning. Never turn into a crosswalk when pedestrians are still using it. 3. Always stop prior to the crosswalk and not in it. 8. Food Truck Thursday Night Concerts. These very popular concerts have been extended until 24 OCT. These events take place in Brook Run Park from 6 - 9 PM every Thursday. If you haven't been to one of these you are missing out on a lot of good times. There is great food, good music and you will see a lot of friends and neighbors there. Thanks to the DHA for being the main sponsor. The City is a co-sponsor. 9. Sirens ... Much to my disappointment the City Council has not moved forward with installing Weather Alert Sirens throughout the city to assist protecting all of us from injury due to severe weather. A lot on communities around us, Sandy Springs, Roswell, Alpharetta, Decatur, Cobb County, etc., have these sirens. It is my opinion that the VAST majority of our citizens favor the installation of the sirens. I would like to hear your opinion. 10. Election ... After much thought and talking with my Family I have decided to seek re-election as your City Council Representive from District One, Post-1. I have appreciated your support over the past five years and seek your continued support moving forward. Much more on that later. 11. That is all from here tonight. I trust all of you enjoyed yourself this beautiful weekend. Please pass this update on to your friends, neighbors, members of your HOA and anyone you think maybe interested. If you would like to be added to my update email list just let me know and I will make that happen. I appreciate your thoughts and comments so keep them coming.